Each week commenter Stu delights you by finding former Minnesota sports figures, tracking them down and telling you -- in his own way -- what they are up to. Stu? 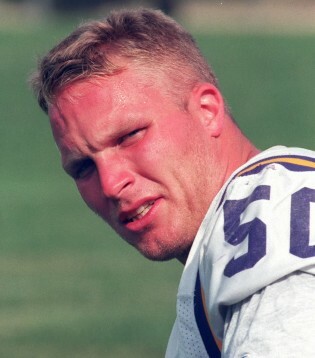 Claim to Fame, Minnesota: a well-traveled linebacker, Brady was thrust into a starting role for the Vikings in 1995 when Jack Del Rio was injured. His first game as a starter was the fondly remembered T.J. Rubley game, where he forced a Brett Favre fumble and intercepted a profoundly ill-advised Rubley pass. He became the starter in 1996, where he earned the nickname “Ol’ Swivelhead” from one of Michael Rand’s former colleagues for his aptitude at watching running backs streak past him (or in Mike Alstott’s case, through him). Brady left the Vikings after the 1997 season. Claim to Fame, Everywhere Else: the reason he’s referred to in most articles as “journeyman linebacker Jeff Brady” is due to playing for Pittsburgh, Green Bay, San Diego, Los Angeles, Tampa Bay, Carolina and Indianapolis in addition to the Vikings. Where He Is Now: would you like to buy a house in the Fort Myers area from a former Vikings middle linebacker? Now you can! Is He On Twitter: no, but it appears his wife and fellow realtor Sarah is. You can buy a house from her, too! Glorious Randomness: Brady was taken in the 12th round of the 1991 NFL Draft, just 11 picks prior to that year’s Mr. Irrelevant, Larry Wanke (the New York Times pronunciation confirms that it’s pronounced WAHN-key, for those interested), and three picks ahead of perennial bye-week fantasy starter Keenan McCardell. Also of note: President Camacho was an early 11th-round pick that year. Friday (The 5 most disappointing Twins) edition: Wha' Happened?